Cop On the Edge Alexander “Hawkeye”, “Hawk” Hawkamoto (Chung) is a man so awesome, even his nickname has a nickname. Formerly a Texas cop, he resettles in Las Vegas where he’s out to settle the score with the mob, led by gangster boss Tony (Wertlieb). After being assigned a new partner, an equally brash detective named Charles Wilson (Jeffreys), the two tear up the town like nobody’s business. Forget MASH, here’s the real Hawkeye! We absolutely loved Hawkeye. This type of movie is right up our alley - it’s fun, funny, ridiculous, and wildly enjoyable. The supposed “amateurish” nature of the movie is far from a negative, it actually endeared us to it even more. Just the level of (non) acting from everyone except the leads is enough to provide more entertainment value than you’ll find in many other movies. 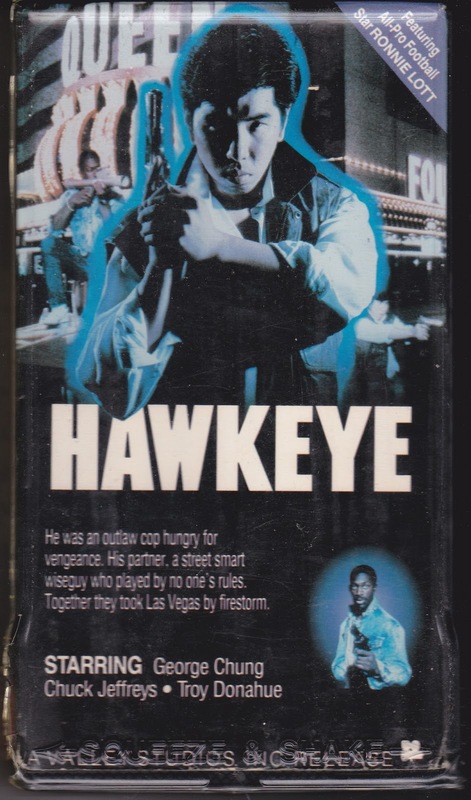 Starting from the great intro, Hawkeye never runs out of steam and is highly watchable the entire time. It wouldn’t be an 80’s cop movie without sax on the soundtrack, acid washed jeans and radical sunglasses. Chuck Jeffreys puts in one of his best performances as the energetic new partner. The movie is also filled with un-PC humor that you never see today. While there seems to be some controversy over who actually directed the movie, Leo Fong or George Chung, it definitely has that Fong-y style we recognize from his past projects. But someone really should look into possible misspellings in the credits (“Kieth”? “Micheal”? “Stien”?) As for George Chung, he’s at his best during “Junior Cadet Day” at the academy, where a bunch of kids come to learn about police work. Apparently it mainly consists of threats. It’s also completely ignored that Chung/Hawkamoto is even Asian, as other characters call him “Cowboy”, he hates Sushi, and doesn’t know what a Dojo is. Throw in some random narration, and there you have it. As if that wasn’t enough, Troy Donahue is (barely) involved, and his use of pauses in his speech makes William Shatner look like John Moschitta. Lest we forget “All-Pro Football Star Ronnie Lott” (if seeing that on a box while perusing a video store doesn’t make you want to rent the film, what will?). An unnecessarily shirtless guy who looks like Jerry Trimble, among a row of meatheads completes the picture. The tape seems like a homemade production, having been released by Valley Studios of Sunnyvale, CA, and the copyright is 1988 Action America Entertainment. Did they ever release anything else? Hopefully. If you have a sense of fun and/or humor, you will totally love this gem. Hawkeye is a bona fide winner. Another Fong film you should check out is Blood Streets. That is definitely a fun movie, we have a review of it in the archives!